Governor Greg Abbott and First Lady Cecilia Abbott today volunteered with Meals on Wheels in Austin, helping deliver Thanksgiving meals to those in need. 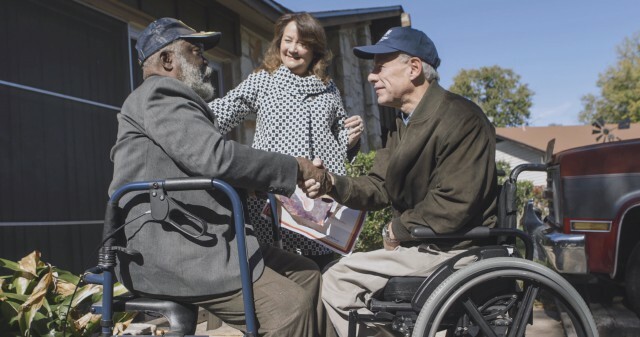 Prior to visiting several homes in the Austin area to deliver meals, the Governor and First Lady First also met with fellow volunteers at the Meals on Wheels Kitchen as they picked up their deliveries. "During this time of thanksgiving, it is important that we offer a helping hand to those in need,” said Governor Abbott. “Even in this time of loss and recovery, I am encouraged by the resiliency of the Texas spirt and the bonds created by Texans helping Texans. Cecilia and I join all of Texas in giving thanks for our many blessings as Texans and as Americans." "Everything is bigger in Texas, especially the desire to lend a helping hand," said First Lady Cecilia Abbott. "Whether it is a warm meal to feed a hungry client, or a warm hug and moment of conversation to feed a hungry soul, Texans can always be counted on to do whatever is needed to take care of one another, and for that we are so thankful."